We are so happy to have my sister, Cecilia, visiting with us this week in Florida. Unfortunately the weather has not been that great so we are spending some time indoors. 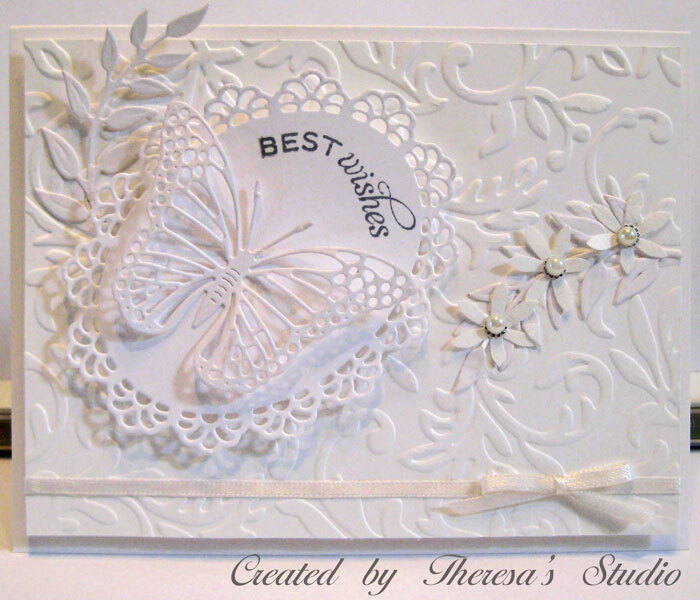 One day my sister who is not a card maker made a card which I am posting today. I am entering her creation in some challenges and maybe she will have a win on her first try. I have been trying to get her to join me in making cards.....maybe this will give her the bug to make more. From my supplies, she selected Blue CS as a base, a My Mind's Eye pattern paper, Pink CS for a mat which I taught her how to cut with a Nesties die on the Big Shot as well the White CS for her image. She used Memento Desert Sand ink to soften the white mat because it looked too stark. She stamped the Butterfly from MFP's Daffodil Greetings set with Memento Rose Bud ink and the sentiment from MFP's Happy Pansies with Memento Rich Cocoa. She embossed the pattern paper (first time embossing) with Cuttlebug EF Swiss Dots. She finished with the addition of looped satin ribbon. All colors and stamps were selected by Cecilia...she has color and scale combinations ....maybe that is from 25 years of teaching elementary school. All work creating this card was completed by her. 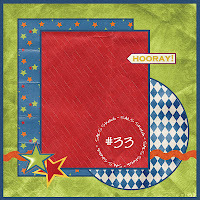 After an early walk on the beach, I decided to make a quick card for Mark's Finest Papers challenge to use pink, brown, and white in a card and also to use a sketch from One Stop Craft Challenge. Since I wanted to use a dark brown cardstock mat and did not have one, I darkened a tan CS by wiping with Memento Rich Cocoa. 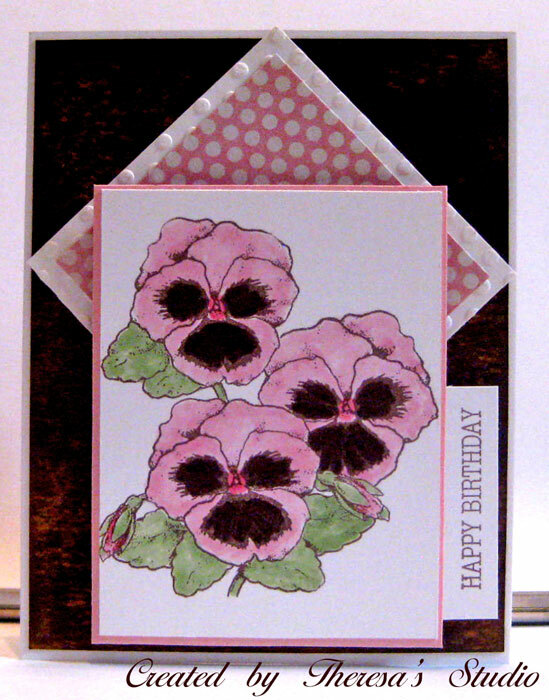 I used the same ink to stamp "Happy Pansies" from Mark's Finest Papers on white CS. I colored with Copics. Used white card base matted with the brown. 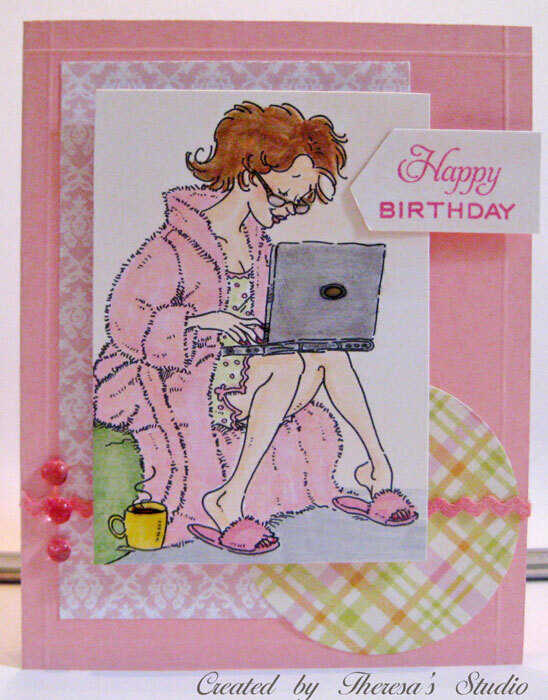 Assembled the card with squares of embossed white CS and MME's pink polka dots. Matted the image with pink CS and finished with Birthday Sentiment. 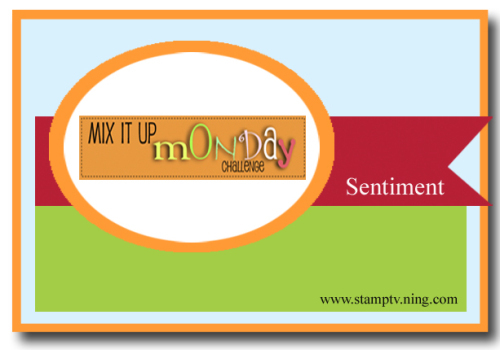 At Stamp TV, the challenge for this Mix It Up Monday is to Case a memeber of Stamp TV. Since I only have the stamp set Stippled Nature by GKD with me, I looked for a card made with it to CASE. 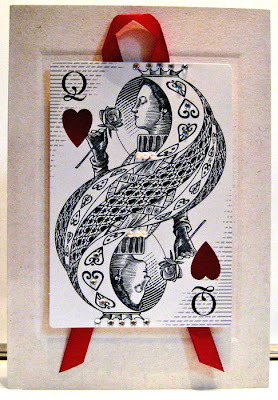 I found a great card by Verna Angehofer here that I am showing below. I made the wood grain background similar to hers using Memento Dessert Sand and Rich Cocoa inks. I did not have any red cardstock to mat the wood grain mat and the image so I just used a Memento Lady Bug marker around the edges. Inks are all Memento and the white cardstock is from GKD. 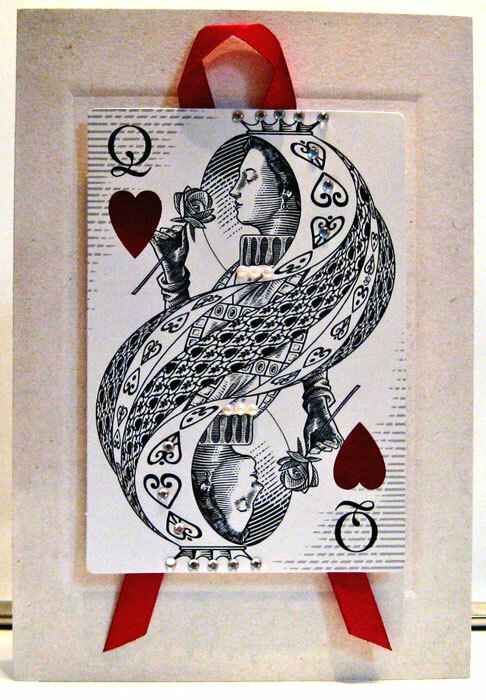 Verna, it was fun to CASE your great card. This image from Mo Manning reminds me how I start my day ....checking email on my laptop....and I may just be sending someone Happy Birthday Greetings as indicated on the card. I printed this digital image "Checking FB" from Mo and colored it with Copics adding some glossy accents to her glasses, computer, and mug. I kept the colors very girlie with pinks and added dew drop bling for more feminine touches. What is more girlie than a pink plushy robe and plushy slippers? Used pattern papers from GKD Petals and Wings pad and solid cs from stash. 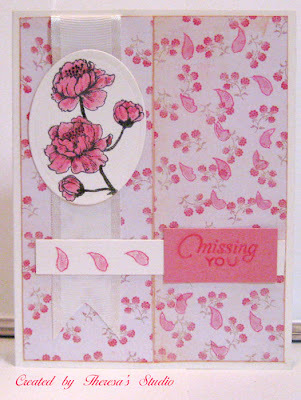 Stamped sentiment from Flourish with Memento Rose Bud ink and added pink rick-rack to finish. Sweet n Sassy: 3-2-1 challenge -- use 3 of one thing, 2 of another and 1 of something else. Used 3 dew drops, 2 pattern papers, and 1 digi image. Whoopsi Daisy: Make it girly. 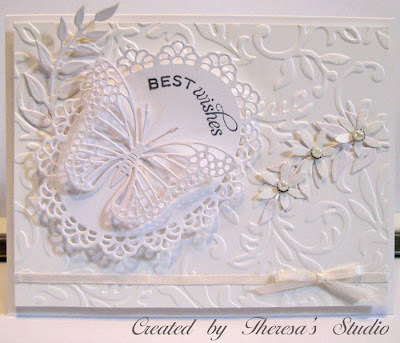 I hope you can see all the details on my white on white card....this is a hard one to photograph under the current light conditions. I used GKD white cardstock for all layers beginning with the card base. The next layer was embossed with Cuttlebug EF Victoria. 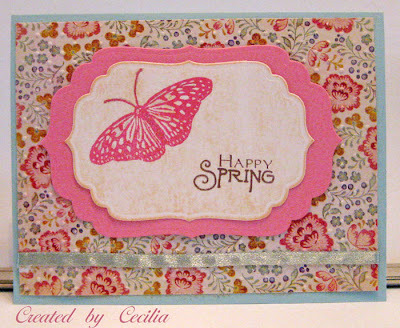 I then layered elements cut with an unknown Lacey Oval Die, Cheery Lynn Olive Branch die, Cheery Lynn Exotic Butterfly #2 small Die. I added some Flowers by Jolee from my stash and three pearls. A white satin ribbon and bow were also added. The Sentiment from Flourishes Stamps was stamped with Memento Gray Flannel ink which is a bit softer than black ink. 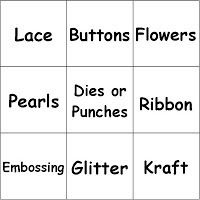 Crafty Catz : Bingo Time . 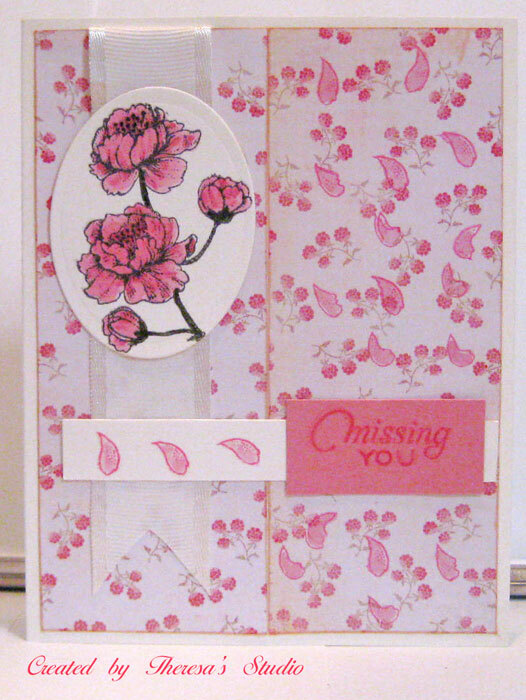 Used middle row Pearls, Dies,and Ribbon or diagonal embossing, dies,flowers. One of my favorites thing to use on cards are bears....love my bear stamps. When The House House of Stamps challenged us to use our fave Repeat Impressions stamp, I knew this bear stamp, Belle, was mine. I stamped Belle with Memento Rich Cocoa ink, colored her with copics and paper pieced her hat and jacket with red textured cardstock scraps. I cut her with a square Nesties and inked the edges and the matted her on a scallop square of the same red cardstock cut with a Nesties. 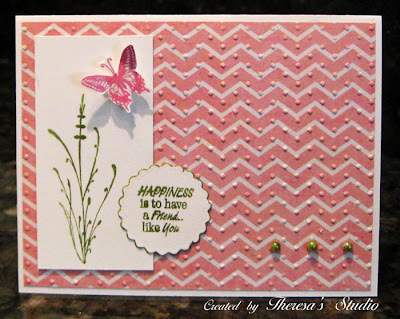 Following the sketch shown, I added a MME Pattern Paper from The Sweetest Thing to the pink card base which I embossed with Cuttlebug EF Divine swirls. 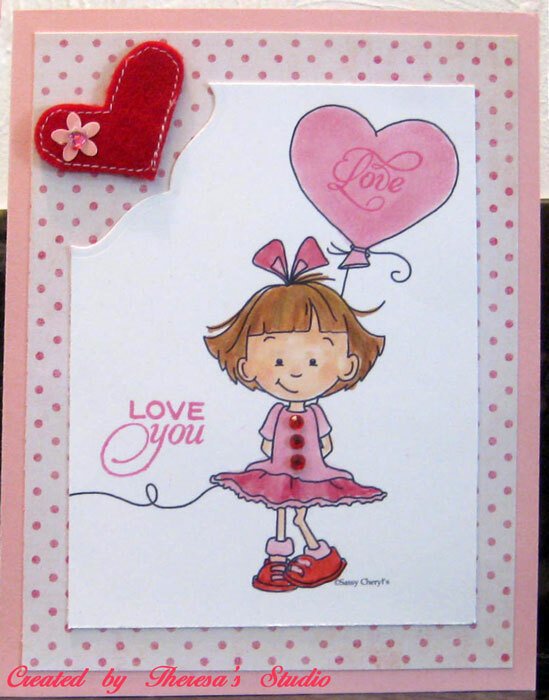 Added pink pearls colored with Copics and a sentiment from Annabelle Stamps stamped with Memento Rose bud ink. 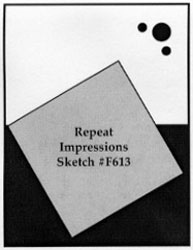 The House That Stamps Built: DCC213-use your favorite Repeat Impressions stamp. Mine is Belle. Papertake Weekly: Hearts and Flowers. Have hearts on the dress, a 3d flower on her hat, and flowers on paper. Party Time Tuesdays: Use 3 of one item. Used 3 Pearls. 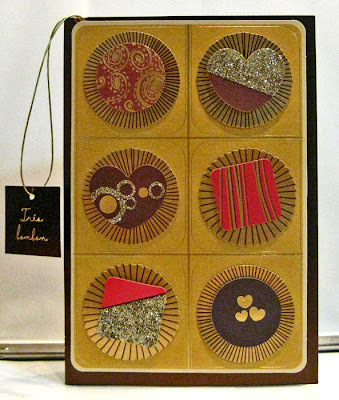 At Timeless Tuesday, Maki is challenging us to use heart elements in our card/project. 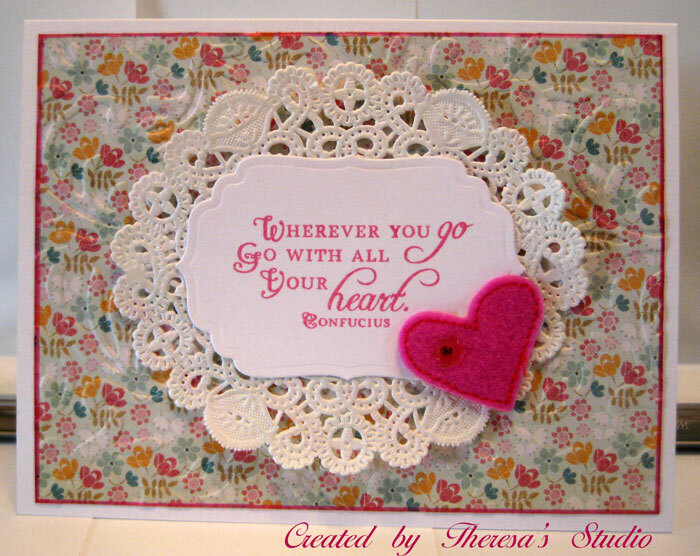 I decided to focus on a heart sentiment on my card using one from Flourishes' Cherry Blossoms set. I paired this with a pink felt heart from my stash. The sentiment was stamped with Memento Rose bud ink on white cardstock and cut with a Spellbinders die which I attached to a doily. The doily was trimmed in the center to shape as an oval. I love how the shape came out. I attached this to a mat of MME pattern paper that I embossed (Cuttlebug EF Victoria) and edged with a pink marker (Memento Rose Bud). I finished with the pink felt heart and plastic flower that was in my stash from some blog candy. 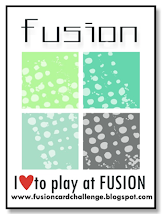 I hope to win some of Flourishes New releases...wish me luck! And I found other challenges to enter my card. Flourishes Timeless Tuesday Challenge: Put your heart on a card. 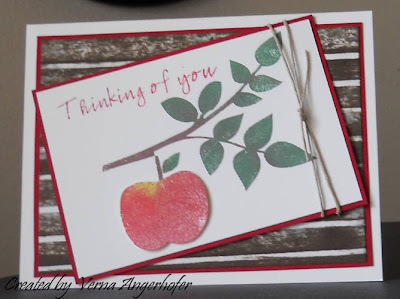 Stamptacular Sunday: From the heart-For this weeks challenge create a card that has a sentiment as the main focus of your card. City Crafter Challenge: Use felt on your project. 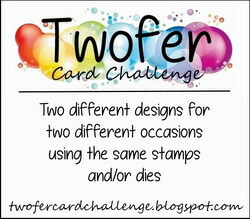 Today is a cloudy day on the island in Florida so I am making some cards for the challenges on my list to do. 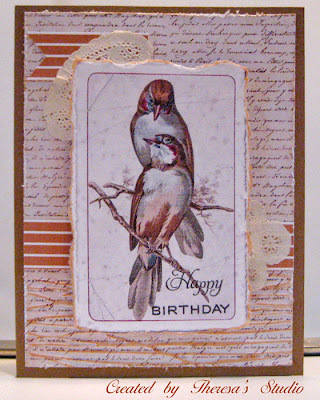 This card is for a sketch at Sweet Sunday and the Feathers and Fur Challenge at Sugar Creek Hollow to do a vintage or shabby chic card to feature birds or furry animals. I chose to use this vintage bird graphic from Create with TLC . I simply printed the image and tore the edge and distressed with ink. I used a GKD Leather card stock for the base to which I layered a mat of MME Script Pattern Paper embossing the lower part with Cuttlebug EF Forest Branches. I added some strips of GKD Stripe Paper and attached cut out pieces of a doily. The sentiment is from Flourishes stamped with Memento Espresso Truffle. Alphabet Challenge: A for anything with wings. Hope everyone had a lovely Valentine Day. Guess I am still thinking about love birds. Today I would like to share some of the cards that I received from My DH for Valentine's Day. I think he spent a great deal of time and thought selecting these cards and they are beautiful. 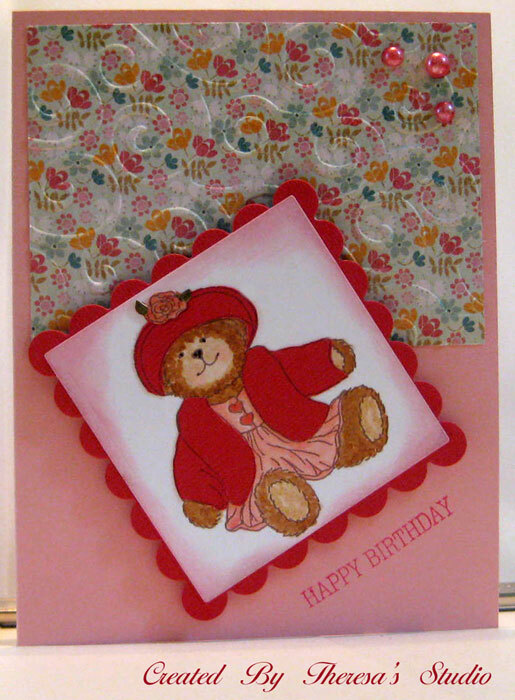 They are from the Hallmark Signature Collection and have beautiful embellishments and details. 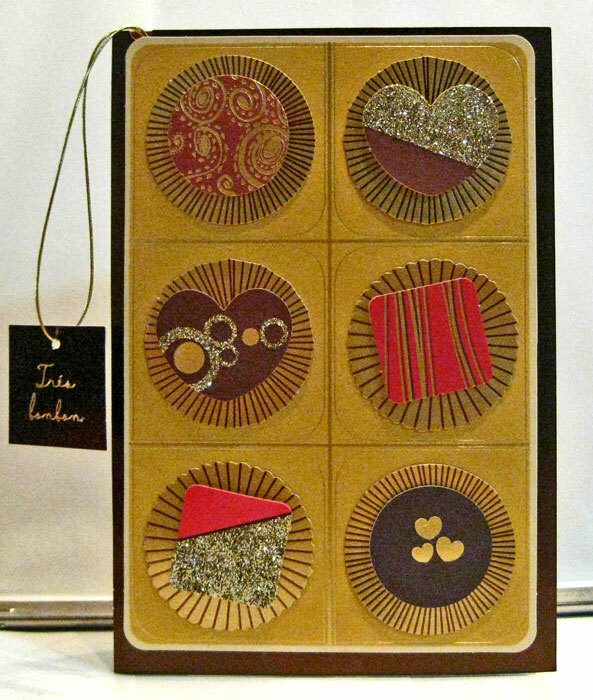 This candy box has a lot of glitter and glitz. Happy Valentine to the Queen of his Heart! Pearls and rhinestones embellish the Queen. 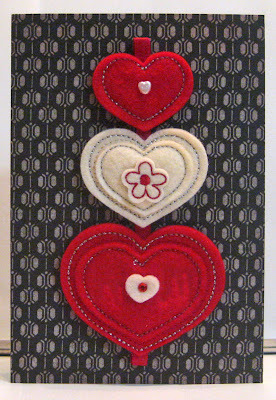 Beautiful felt hearts on this card. He likes giving me cards that inspire me with new ideas and techniques. Thanks to him for his support of my card making. 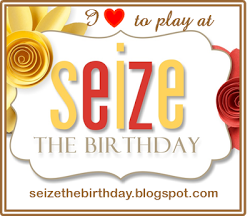 My card today is made from a Sassy Cheryl digi image Sassy Sally's Heart Balloon. 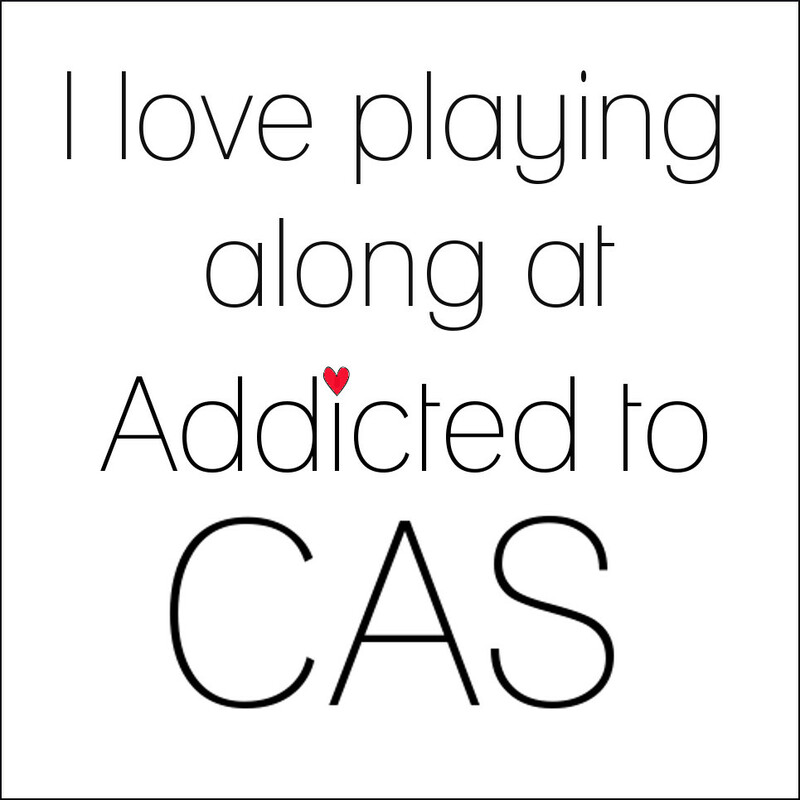 I think she is so fun to play with. I used the sketch from The Sweet Stop Sketch Challenge and also used the colors on the sketch. After printing the image, I colored her with copics and stamped the MFP's Sentiment with Memento Rose Bud ink. I added the image and pink cardstock strips that I embossed with Cuttlebug Victoria EF to a black cardstock base. Finished with a strip of pink ribbon and a tie. Digital Tuesday Challenge: Up, Up and Away...use balloons,etc. Speedy Fox and Friends Challenge: Show some love for Valentine's. At Flourishes, they are having a one of a kind challenge for their new release where YOU pick the course of your challenge. 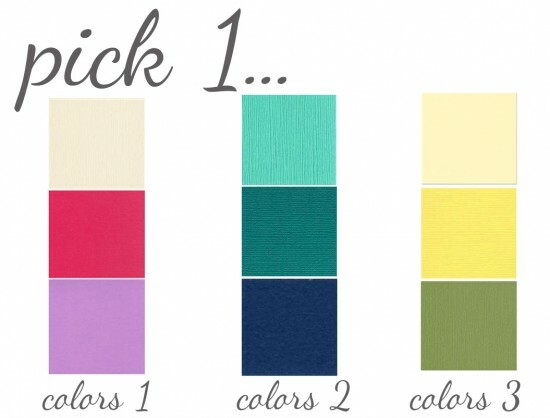 It’s three different choices, and you need to pick one out of each three! We have three sketches….next, we have three color schemes and finally, we have three embellishments. I selected the first sketch, colors 3 using ivory, green and yellow, and embellishment of satin ribbon. 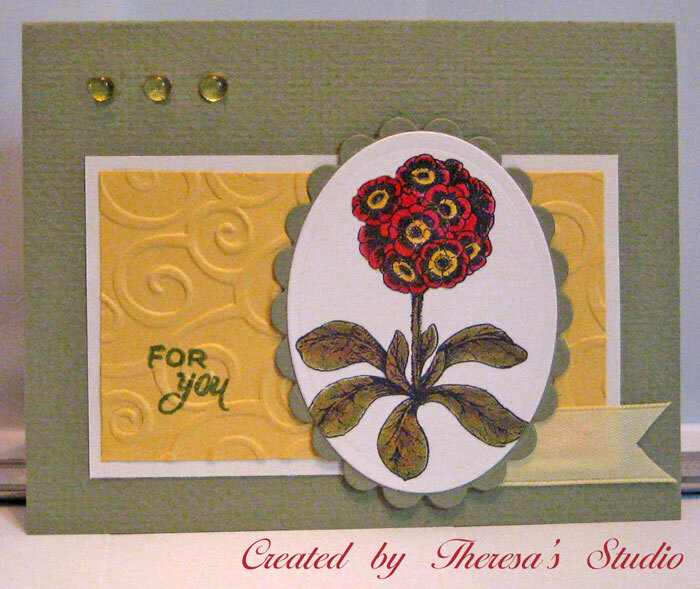 I used the Flourishes stamp Primroses from A Year of Flowers that I colored with copics. Used a card base of olive green cardstock, ivory mat under the yellow embossed mat and layered on top the image on an oval ivory cardstock matted with scallop oval of green. Finished with a yellow satin ribbon and yellow Dew Drops. For You Sentiment from Flourishes Taglines. 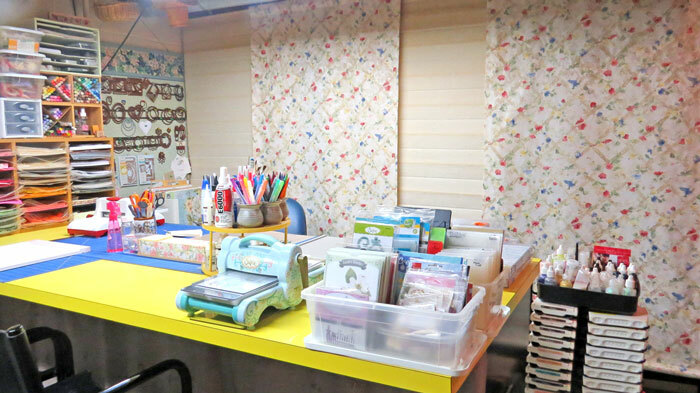 At Stamp TV, Valerie is challenging us to make three 3" x 3" cards using the same supplies: stamps, papers, inks and embellishments. Change them up so they aren't exactly the same. 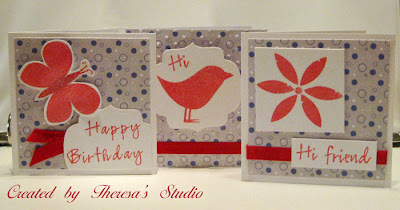 My 3 cards were made with white cardstock, GKD PP from Pool Side paper pack, Memento Lady Bug ink, GKD "Stippled Nature" stamp set, and scrap of red ribbon. This was a fun and simple challenge but it did more than 30 minutes so no bonus points for me. Clear It Out Challenge: Use red and white items....used scraps of red ribbon and scraps of white cs. I am trying to make a card a day....keeps the creative juices flowing. 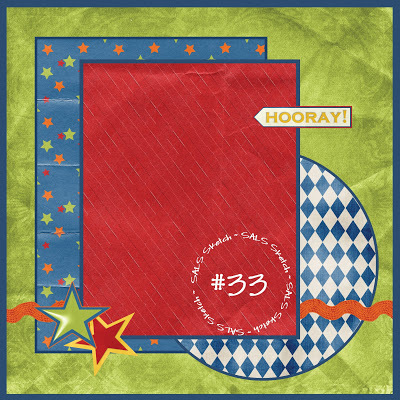 This one I made using the sketch challenge for Flourishes Timeless Tuesday Challenge. I used a base card of Ivory CS, layered with mats of My Mind's Eye DP The Sweetest Thing, and stamped the right side with falling Cherry Blossoms for some interest. I stamped the Cherry Blossom on an ivory oval diecut and colored with Copics. 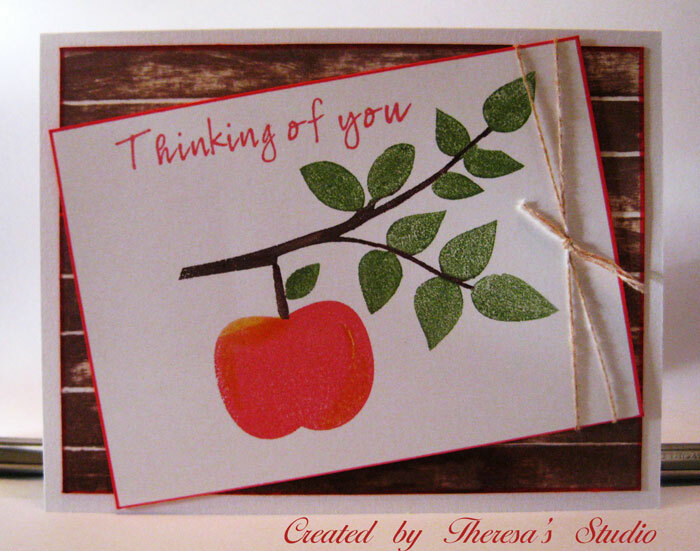 Finished the card by assembling the ribbon, sentiment, strip with leaves, and image. 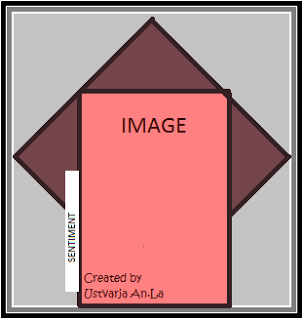 Timeless Tuesday: FTTC206 Create a card using sketch shown. Welcome! 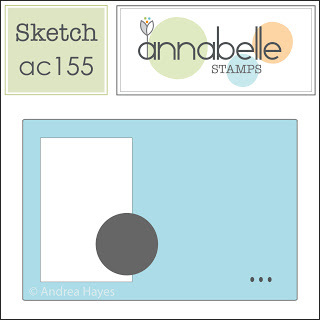 Today I have a card for the sketch challenge at Stamp TV. I used a GKD set "Stippled Nature" that I have had since Christmas but never used. I stamped the Butterfly and Birthday sentiment in Memento Lady bug for this one. 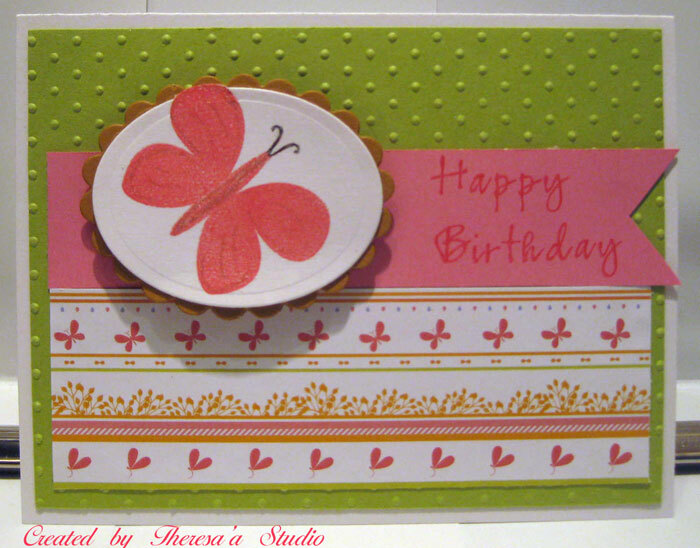 I started with a white base card, added a grass green mat embossed with Swiss Dots from Cuttlebug, layered with strips of Pink and PP from GKD Petals & Wings paper pack, and topped with the butterfly cut with oval die and placed on scallop oval. Added some Clear Star glitter to butterfly. Like the combo of colors. Romantic love makes a come back. In years of yore, a guy knew just how to make romance. That is what is dipicted from this graphic that I found at Moonlight Madness Studio Free Images. 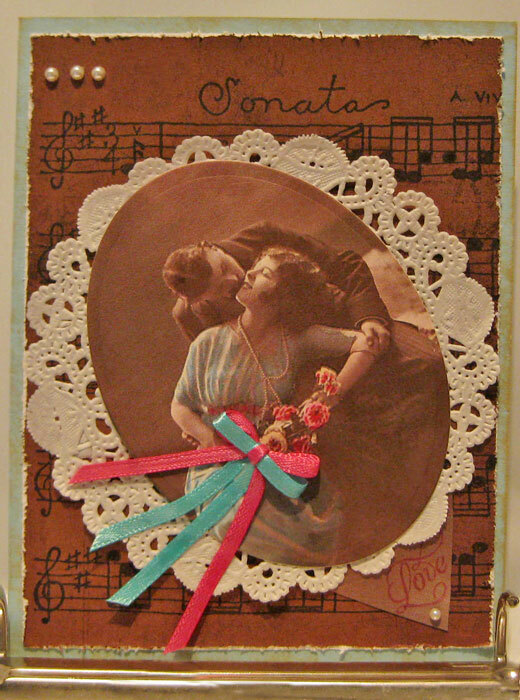 I used this to make a card for Sugar Creek Hollow challenge to make Vintage or Shabby Chic cards that depict ROMANTIC LOVE. I started with card base of turquoise that I distressed with ink and added a leftover mat of paper that I had stamped with music (unknown source). To this I layered a small doily from stash and the image cut with an oval die. I arranged the image at an angle to give some interest and motion. Finished with pearls, ribbons, and some love...a sentiment from Flourishes. I think I hear a George Gerswhin tune. Stamptacular Sunday: Gents and Gems. Used pearls as gems. Stamping is the music on background and word love. There are a lot of challenges for Love and Valentine cards this week. I made this one with a digi image from Sassy Chery. Isn't she the cutest? I colored her with Copics after printing on white CS. Added some rhinestones to her dress. Since I did not have a corner punch, I used a die to trim the corner and placed a felt heart from my stash in the corner. I used a DP from My Mind's Eye as a mat and place on a card base of pink card stock. I stamped sentiments with Memento Rose Bud from Flourishes Taglines to finish. 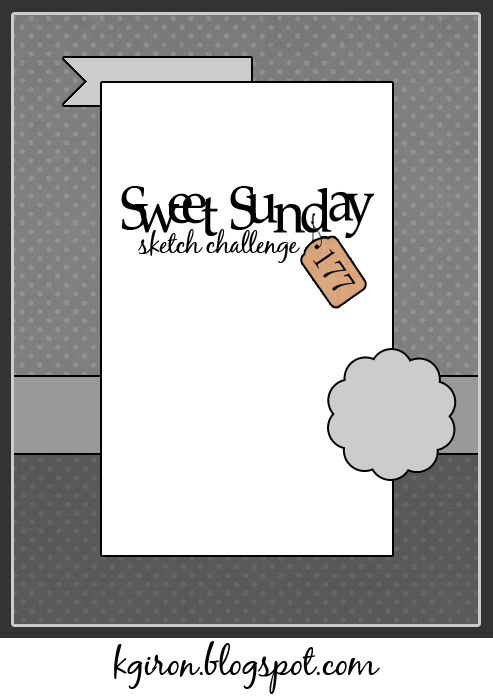 Sweet n Sassy Digi Challenges: Valentine Day or Love cards. Sweet Stampin' Challenge: Love is all around. My DH and I are in sunny Florida enjoying some sunshine instead of the snow and cold in Ohio. 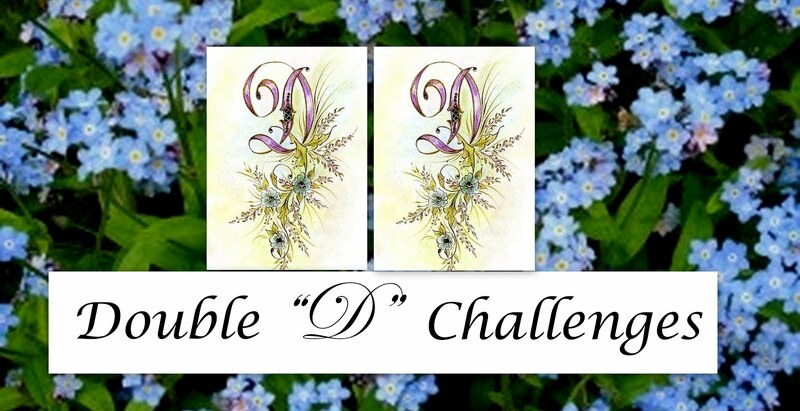 I had time today to make a card for Annabelle's challenges and a few others. I plan to keep my posts short and sweet while I am away in FL. In the photo, the popped up butterfly cast a long shadow on the card. I have to find a better lighted location for making photographs. The supplies for this card are stamps from Annabelle Stamp "All Things Grow", papers from My Mind's Eye The Sweetest Thing, white CS from GKD, Memento Inks Bamboo Leaves and Rose Bud, pearls colored with Copic YG63, Sakura ClearStar pen, and Cuttlebug EF Swiss Dots. Alphabet Challenge: Z is for zig zags. ABC Challenge: G is for going dotty. Swiss dots used for texture. 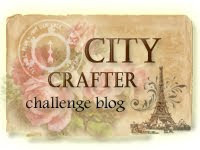 City Crafter Challenge: Just for you my friend. Shopping Our Stash Challenge: Use your oldest bling. Used pearls which has to be the first bling that I bought. Sweet Stamp Blog: Think pink. Flutter By Wednesday: Open challenge.